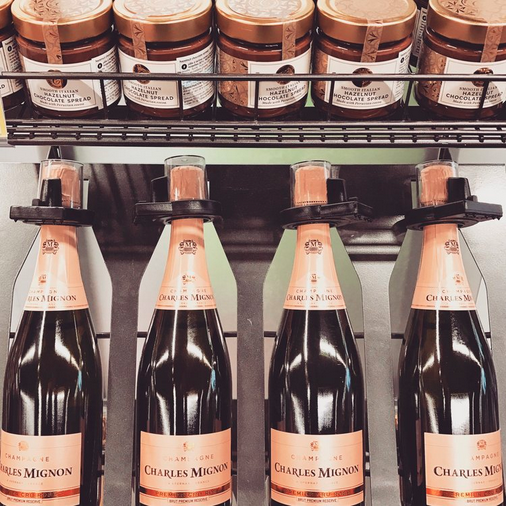 Chocolate spread and champagne sold side by side in Marks & Spencer ... only in Paris! Australian wine. or wine of any kind from outside of France, I suspect. Because if you do, you may experience the same twinge of cultural shame I felt after presenting my French friend with what I thought was a "very good" wine (as advised by the Brisbane airport duty-free bottle shop manner, who was told the wine was for a sophisticated French man, so please select something very good). Generally, when you give an Aussie a gift of wine, you'll get a "thanks mate", the bottle will be given a cursory glance and promptly opened for (likely) speedy consumption. Perhaps that's why alcohol isn't sold in Australian supermarkets, while in France its right next to the Nutella; we tend to consume it for inebriation rather than with appreciation, commes les françaises. I've experienced French wine of course, and though I'm no expert, I do recognise, appreciate and enjoy the vast difference between both French and Australian wines. What I wasn't prepared for though, was the level of serious attention given to my simple gift. It was a humbling education in french attention to detail. The label was duly considered, the vignoble questioned, the age appraised, the alcohol content double-checked ... and that's before the contents were carefully poured, scrutinised, sniffed, sipped, swirled and smacked around a few times, and then reappraised with each fresh pour. The final verdict? Cringing in my chair and wishing I'd just brought over a jar of Vegemite instead : "Zere is no alcohol in zees wine, eet ees only resin"!